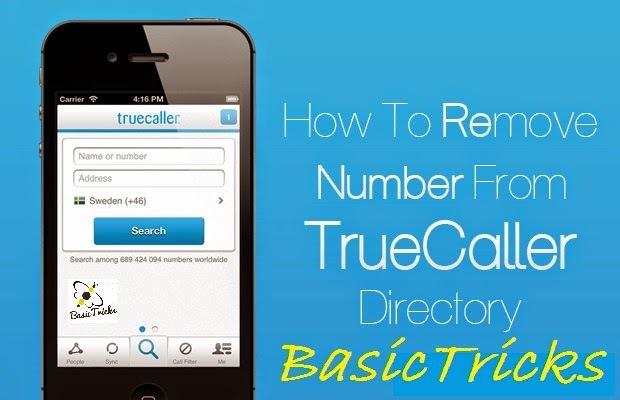 How to Remove Number from Truecaller. Now you can remove your number from truecaller WIth simple steps. You all may know about the truecaller app, then why to talk about it again. If you are the one who has been frustrated due to the prank phones calls and want to remove your number from Truecaller app then you are the right place. Follow the below steps to remove your number from truecaller app. At Some crucial times, few of the people may undergo for depression because of certain prank phone calls. But there is a solution to remove the number from truecaller app..Truecaller is an great app which provides the complete information about any contact number within few seconds. This app is available and works on all smart phones and suits for any operating system such as iOS, android, windows etc. This app is absolutely free of cost for all Operating systems platforms and gives information about all the contact numbers. There are some persons who want their name to appear in Truecaller app or let others to view their info. But due to some security or personal issue. For such people, Truecaller has the best solution to remove their contact numbers from Truecaller Directory. So to help those people who want to remove the number here i made a tutorial on “How to Remove Number from Truecaller”. So follow the below steps to remove your number. You will see the below image as your screen. Enter your mobile number and enter the Captcha Code. Now click on Blue Unlist Button. Successfully you have removed your number from Truecaller Database. 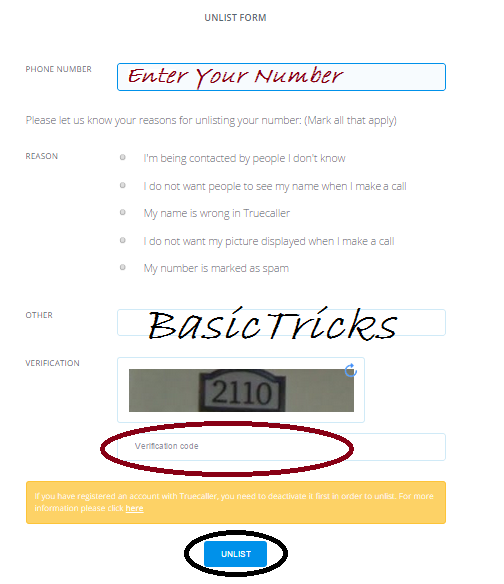 Now your number information will not be appear in the truecaller app. Now you have done with your work. So at last you have learnt “How to Remove Number from Truecaller app“. Feel free to share your question regarding the removal of your number we are here to help you. Don’t Miss any tutorial from Basictricks.Net. Like us and share us with your friends.